The Universe is so vast, and like human beings there may be presence of some other creatures on some other planet in this galaxy or in some other galaxy. Many evidences has proved that some other creatures visits Earth many times, they are not like any of the creatures present on the Earth, Those same are called Aliens. But almost all the Scientific Organisations are conctineously refusing for the presence of Aliens anywhere, and claiming that they are still searching for such creatures. Many orgainsations like NASA, SETI etc has done (and still doing) many efforts to findout the truth of Aliens. For the same NASA has sent many of their space crafts to far distances with such material so that if Aliens find them, then they can atleast know about us (about Earth and Humans), can reply or response suitably. In this series some of the mission are briefed below.. The Pioneer program is a series of United States unmanned space missions. The program was designed for planetary exploration. There were a number of such missions in the program, but the most notable were Pioneer 10 and Pioneer 11. The Pioneer spacecraft were the first human-built objects to leave the solar system, which explored the outer planets and left the solar system. Both carry a golden plaque. The Pioneer golden plaques are a pair of gold-anodized aluminium plaques which were placed on Pioneer 10 and Pioneer 11 spacecraft, having a pictorial message, depicting a man and a woman and information about the origin and the creators of the probes, in case either Pioneer 10 or 11 are intercepted by extraterrestrial life someday. The plaques were attached to the spacecraft’s antenna support struts in a position that would shield them from erosion by stellar dust.Pioneer 10 was launched in March 1972 and Pioneer 11 was launched in April 1973. At the top left of the plaque is a schematic representation of the energy transition between the parallel and anti-parallel proton and electron spins in the neutral hydrogen atom. The key to translating the plaque lies in understanding the breakdown of the most common element in the universe – hydrogen. This element is illustrated in the left-hand corner of the plaque in schematic form showing the hyperfine transition of neutral atomic hydrogen. Anyone from a scientifically educated civilization having enough knowledge of hydrogen would be able to translate the message. On the plaque a man and woman stand before an outline of the spacecraft. The man’s hand is raised in a gesture of good will. The physical makeup of the man and woman were determined from results of a computerized analysis of the average person in our civilization. 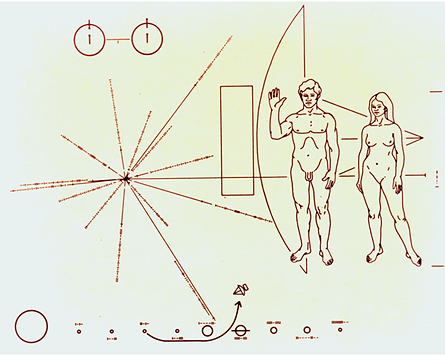 The plaque was designed by Dr. Carl Sagan of Cornell University and drawn by Linda Salzman Sagan. >> Designed for Planetary exploration. >> Pioneer 10 was launched in March 1972. >> Pioneer 11 was launched in April 1973. >> Pair of gold-anodized aluminum plaques. >> Placed on Pioneer 10 & Pinoeer 11 Spacecraft. >> Designed by – Dr. Carl Sagan and Dr. Frank Drake. >> Drawn by Linda Salzman Sagan. >> Size – 15-cm by 23-cm (6-in. by 9-in.). It was a message signal transmitted into space via frequency modulated radio waves toward the star cluster M13. The message was broadcasted at a ceremony to mark the remodeling of the Arecibo radio telescope on 16 November 1974. It was transmitted to the globular star cluster M13 (some 25,000 light years away) because M 13 was a large and close collection of stars that was available in the sky at the time and place of the ceremony.The message mainly Consisted of 1679 binary digits, approximately 210 bytes, Transmitted at a frequency of 2380 MHz Modulated by shifting the frequency by 10 Hz, With a power of 1000 kW. The “ones” and “zeros” were transmitted at the rate of 10 bits per second (by frequency shifting).Total broadcast was less than three minutes. Dr. Frank Drake wrote the message, with help from Carl Sagan, among others.The message consists of seven parts that encode the following:1. The numbers one (1) through ten (10)2. The atomic numbers of the elements hydrogen, carbon, nitrogen, oxygen, and phosphorus, which make up deoxyribonucleic acid (DNA)3. The formulas for the sugars and bases in the nucleotides of DNA4. The number of nucleotides in DNA, and a graphic of the double helix structure of DNA5. A graphic figure of a human, the dimension (physical height) of an average man, and the human population of Earth6. A graphic of the Solar System7. A graphic of the Arecibo radio telescope and the dimension (the physical diameter) of the transmitting antenna dishThe cardinality of 1679 was chosen because it is a semiprime(the product of two prime numbers), to be arranged rectangularlyas 73 rows by 23 columns. The alternative arrangement, 23 rows by 73 columns, produces jumbled nonsense. The message forms the image shown on the right, or its inverse, when translated into graphics characters and spaces. Because it will take 25,000 years for the message to reach its intended destination of stars (and an additional 25,000 years for any reply), the Arecibo message was more a demonstration of human technological achievement than a real attempt to enter into a conversation with extraterrestrials. In fact, the stars of M13 that the message was aimed at will no longer be in that location when the message arrives. According to the Cornell News press release of November 12, 1999, the real purpose of the message was not to make contact, but to demonstrate the capabilities of newly installed equipment. The Voyager program is a U.S program that launched two unmanned space missions, these scientific probes were named as Voyager 1 and Voyager 2, launched in 1977. The primary mission was the exploration of Jupiter and Saturn. The probes were able to continue their mission into the outer solar system, and are as of June 2011 on course to exit the solar system. Voyager 1 is currently the farthest human-made object from Earth. Voyager 1 and 2 both carry with them a golden record that contains pictures and sounds of Earth, along with symbolic directions for playing the record and data detailing the location of Earth. The record is intended as a combination time capsule and interstellar message to any civilization, alien or far-future human that recovers either of the Voyager craft. The contents of this record were selected by a committee chaired by Carl Sagan.Pioneers 10 and 11, which were launched in 1972 and 1973 and preceded Voyager in outstripping the gravitational attraction of the Sun, both carried small metal plaques identifying their time and place of origin for the benefit of any other spacefarers that might find them in the distant future. NASA placed a more ambitious message aboard Voyager 1 and 2- a kind of time capsule, intended to communicate a story of our world to extraterrestrials. 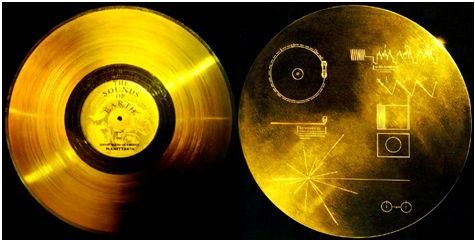 The Voyager message is carried by a phonograph record-a 12-inch gold-plated copper disk containing sounds and images selected to portray the diversity of life and culture on Earth. They contain sounds and images selected to portray the diversity of life and culture on Earth, and are intended for any intelligent extraterrestrial life form, or for future humans, who may find them.As the probes are extremely small compared to the vastness of interstellar space, the probability of a space faring civilization encountering them is very small, especially since the probes will eventually stop emitting any kind of electromagnetic radiation. If they are ever found by an alien species, it will most likely be far in the future as the nearest star on Voyager 1’s trajectory will only be reached in 40,000 years. As Carl Sagan (1934–1996) noted, “The spacecraft will be encountered and the record played only if there are advanced space-faring civilizations in interstellar space. But the launching of this ‘bottle’ into the cosmic ‘ocean’ says something very hopeful about life on this planet.” Thus the record is best seen as a time capsule or a symbolic statement rather than a serious attempt to communicate with extraterrestrial life. “This is a present from a small, distant world, a token of our sounds, our science, our images, our music, our thoughts and our feelings. We are attempting to survive our time so we may live into yours.” Said by U.S. President Jimmy Carter”Contents of the Voyager Golden Record :Contents were selected by a committee chaired by Carl Saganof Cornell University. Dr. Sagan and his associates assembled 116 images and a variety of natural sounds (made by surf, wind, and thunder, and animal sounds, including the songs of birds and whales) Also added musical selections from different cultures and eras, spoken greetings in fifty-five languages including Hindi.Many photographs and diagrams both in black and white and color. Printed messages were from President Jimmy Carter and U.N. Secretary-General Kurt Waldheim. Some Images of scientific interest, showing mathematical and physical quantities, the solar system and its planets, DNA, and human anatomy and reproduction. Some images of animals, insects, plants and landscapes. Some images show food, architecture, and humans in portraits etc. Scales of time, size, or mass. Some images contain indications of chemical composition. The musical selection is also varied, featuring artists such as Beethoven, Guan Pinghu,Mozart, Stravinsky and Chuck Berry. The 116 images are encoded in analogue form and composed of 512 vertical lines. The remainder of the record is audio, designed to be played at 16⅔ revolutions per minute. It contains the spoken greetings, beginning with Akkadian, which was spoken in Sumer about six thousand years ago, and ending with Wu, a modern Chinese dialect. Following the section on the sounds of Earth, there is an eclectic 90-minute selection of music, including both Eastern and Western classics and a variety of ethnic music. Recorded at – Baroda, India. Recorded By – NASA’s Radio Receiving Centre. There is a NASA’s Radio Receiving Centre at Baroda, India where a signals were received (in 2009) about 12 times in one month. Radio receiver has two antennas (with height of 46 ft and 10 ft), the sound of received signal was of two types, one was something like Sea -wave’s sound and another was like sound of hitting metal sheet by small stones. The signals were sent to many Radio signal specialists for analysis, but it is a big mystery that who sent these signal and what they mean. NASA Radio Observatory & many other Scientists are researching on these signals. These are also said that these belongs to the aliens. WOW Signal It is the most famous signal which was detected on the night of 15 August 1977 at the Ohio State University Big Ear Observatory. It lasted for the full 72 second duration that Big Ear observed it, but has not been detected again. Scientists believe the signal may be evidence of an extra- terrestrial intelligence. Signal detected on : the night of 15 August 1977. At: The Big Ear radio telescope of Ohio State University. Some important points related to Wow! Signal..
>> The Big Ear telescope was fixed and used the rotation of the Earth to scan the sky. >> Big Ear was searching the skies for an alien (extra- terrestrial) signal. >> Its observations were being recorded on a printout sheet. >> A long list of letters and numbers was continuously being churned out, one long string for every one of the 50 channels scanned by the telescope. >> A series of characters appeared recording an unusual transmission at the frequency of channel 2: “6EQUJ5” the list read. >> This startled Big Ear volunteer Jerry Ehman, a professor at Franklin – University in Columbus, who was monitoring the readings that night. >> Ehman circled the signal on the computer printout and wrote the comment “Wow!” on its side. >> This comment became the name of the signal . >> The series “6EQUJ5” described the strength of the received signal over a short time-span. In the system used at the time at Big Ear, each number from 1 to 9 represented the signal level above the background noise. >> Two different values for its frequency have been given 1420.356 MHz (J. D. Kraus) and 1420.4556 MHz (J. R. Ehman). >> The frequency 1420 is significant for searchers because, it is reasoned, hydrogen is the most common element in the universe, and hydrogen resonates at about 1420 Mhz, thus extraterrestrials might use that frequency on which to transmit a strong signal. The frequency of the Wow! signal matches very closely with the hydrogen line, which is at 1420.40575177 MHz.OW signal, complete with Jerry Ehman’s famous exclamation, is preserved by the Ohio Historical Society. >> The signal bore expected hallmarks of potential non-terrestrial and non-solar system origin.